Widely cited but never translated, Othenio Abel's 1914 book Die Tiere der Vorwelt (The Animals of the Prehistoric World) contains inventive discussions of the origins of mythological monsters in fossils discovered by ancient humans. Some of these speculations go far beyond the facts, but the most frequently cited of Abel's fossil claims by later scholars is his identification of the skull of the dwarf elephant as the original of the cyclopes of mythology, arguing that the single eye was abstracted from the nasal opening of the elephant skull. Note that the Greek philosopher cited, Empedocles, did not actually investigate elephants; this claim is a modern myth invented, apparently, by Abel himself. The reference to Boccaccio is to Genealogy of the Gentile Gods 4.68, in which Boccaccio describes the discovery of the fossil remains of a skeleton some thought might have been Polyphemus. The random finds of large Tertiary and Ice Age vertebrates have led to the most adventurous ideas since ancient times. Even in ancient times people devoted special attention to such discoveries and almost always connected them with their deeply rooted belief in the idea of ​​giant people. In several cases it is possible to determine the origin and development of some of these myths. Thus, it is easily possible to extract the purely mythological ingredients from the legend of the Cyclops Polyphemus in order to reveal its real core. According to the ideas of the Homeric Greeks, huge people with a single large eye in the middle of the forehead lived in Sicily. Homer tells how Odysseus on his travels came to the land of the Cyclopes and took shelter in a cave, not knowing that he had entered the chamber of a Cyclops. He then tells how the enormous giant Polyphemus drove his flock of sheep into the cave in the evening and murdered and devoured six companions of Odysseus, but finally was made drunk by the cunning of Odysseus and was blinded. He tells also how the wily adventurer Odysseus finally fled with his companions. All the details are given in the ninth book of the Odyssey. First, we notice that Sicily was considered as the particular land of one-eyed, cave-dwelling Cyclopes. Particularly remarkable, however, is the fable of the monocular vision of the Cyclops. Let us investigate what circumstances may have spurred the creation of this legend. Situated close to the seashore caves in the area of ​​Messina and in many other parts of Sicily, such as Palermo and Trapani, one finds even today remains of dwarf elephants that lived during the Ice Age and have been described as a separate species. Repeatedly in classical antiquity one finds references to such bones in Sicily: Empedocles (492-432 BC) reported such discoveries and believed them to be remnants of an extinct giant race. Giovanni Boccaccio speaks in the fourth book of his Genealogy of the Gods of the discovery of the skeletal remains of Polyphemus in a cave near Trapani in the fourteenth century. Many years later, the learned Jesuit Athanasius Kircher visited this place and saw the remains. He writes in his Mundus subterraneus of 1664 that according to his estimate of the skeletal dimensions, the giant Polyphemus was more than thirty feet long and not three hundred, as Boccaccio had indicated. The Homeric heroes, who had never known elephants, therefore would compare the fossil skull of an elephant with the forms of animal known to them to analogize a close relationship. The curved shape of the skull suggests that the most likely comparison would have been with a human skull. It was therefore necessary for the first discoverer of such a skull to reach for the idea of ​​giant monsters which harbored the human form but differed from normal people by having but a single, huge eye in the center of the forehead. Sailors of Homeric or pre-Homeric times were probably the first to bring these giant customers into their homes. They were perhaps in a beach cave in Sicily and sought shelter from bad weather. In lighting a fire, they saw an elephant skull projecting from the clay. Everything else is a later addition from a time that was inclined to see encounters with all manner of gods and sons of gods and supernatural phenomena everywhere, thus finally forming from this first discovery of living giants the whole saga of the fight with and outwitting of the monster. 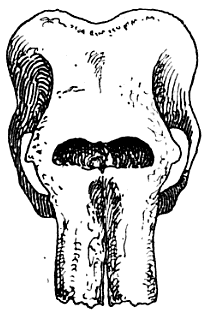 Figure 5: Elephant skull, seen from the front without tusks, with the "eye" of Polyphemus, i.e. the nasal opening, in the center of the brow. 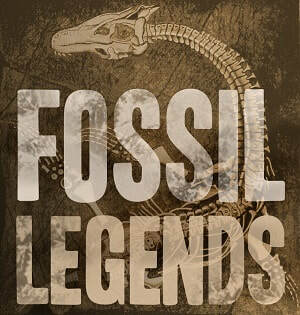 Discoveries of fossil bones, which continued to be made in the Middle Ages and in modern times and are still partly preserved, have been in every age the cause behind the formation of the legends of giants. Not only the Cyclops myth but probably also the legends of the Gigantes and the Titans are due to the finding of the bones of large mammals in the sands, gravels, and clay formations of the ancient civilized countries of the Mediterranean area. Source: Othenio Abel, Die Tier der Vorwelt (Leipzig: Drug und Derlag, 1914), 31-33. Translation © 2012 Jason Colavito. All rights reserved.